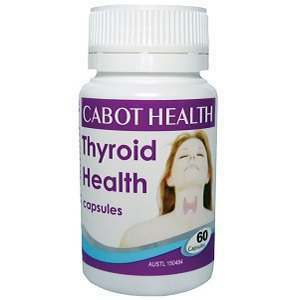 This is a product review for Cabot Health Thyroid Health. This product contains four ingredients that support the functions of the thyroid gland. It also purports to ensure healthy thyroid tissues. Read on to learn more about this dietary supplement. 533 mg of Kelp (Fucus Vesiculosus)- This ingredient provides 160 mcg of iodine, which plays a significant role in supporting the production of the thyroid hormones T3 and T4. Iodine also helps to maintain healthy metabolic processes. 100 mcg of Selenium (Selenomethionine)- Selenium has a number of functions such as supporting thyroid gland functions, stimulating the conversion of T4 to T3, supporting thyroid hormone production, maintaining a healthy immune system, hindering inflammation, and protecting thyroid tissues from damage. 1000 IU of Vitamin D (Cholecalciferol)- Low amounts of this vitamin contribute to thyroid disorders. This vitamin improves both thyroid and immune system functions. 5 mg of Zinc (sulfate)- This mineral has a number of benefits to your body. It has antioxidant properties for protecting body tissues from damage. Zinc also ensures a healthy immune system and supports thyroid functions by stimulating the thyroid gland. Zinc is also essential in the conversion of T4 to T3. Children above 12 years of age and adults should take one capsule daily with a meal. This product can also be taken as directed by a healthcare professional. Do not exceed 150 mcg in a day to avoid unwanted effects. This dietary supplement contains selenium, a toxic substance when consumed in large quantities. Therefore, there are chances of experiencing unwanted effects in case of excessive consumption of this product. The price of one bottle containing 120 capsules is $54 on the manufacturer’s official site. This is a relatively high amount compared to the price of related dietary supplements. Nevertheless, this is a fair price considering that one bottle contains many capsules compared to most products in the market. The manufacturer of this dietary supplement is committed to providing customers with high-quality products subject to quality checks and controls. The manufacturer offers 100 percent satisfaction guarantee to show that all products are of high quality. This guarantee allows customers who are not 100 percent satisfied with this product or any other product to return it within 30 days from the purchase date for a full refund of the purchase price. This refund is also applicable to defective or damaged products. We did not find any testimonials from persons who have tried this dietary supplement. The absence of product reviews is likely to prompt quality-related issues among potential buyers. In conclusion, this dietary supplement has a unique formula with only four ingredients that claim to address thyroid-related problems. It has both positive and negative features that customers need to know. The product’s positive features include a money-back guarantee and adequate concentrations of the key ingredients. However, there are chances of experiencing unwanted reactions in case of accidental dosage. Furthermore, there are no customer reviews to prove that this product meets the expectations of users. Moreover, this product is somewhat pricey. Click here to learn about our Top Thyroid Treatment Products. Lauren Shepherdson	reviewed Cabot Health Thyroid Health	on November 23rd	 and gave it a rating of 2.5. Copyright © 2019 Thyroid Center- All Rights Reserved.